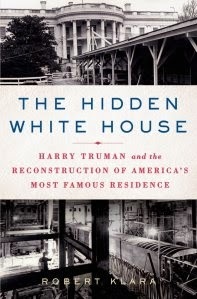 In a newly published book, The Hidden White House – Harry Truman and the Reconstruction of America’s Most Famous Residence, Robert Klara has written the definitive, not to be surpassed, work on this sometimes overlooked major saving and reconstruction of the White House, complete with 32 revealing photos of the building and people involved in this multimillion dollar public construction project. A riveting story told well: Robert Klara is a superb story-teller and historian who brings to life the untold stories surrounding this mid-twentieth century reconstruction of the White House. Klara’s narrative is filled with incredible detail, all supported by meticulous research and facts. What is incredible is that the details do not get in the way, but instead enhance this rich and riveting story. Klara’s book is a delight to read and I found it hard to put it down. I’m giving away 3 free copies of the book: I thoroughly enjoyed reading every page of this engaging book, and I know you will too. On New Years Day (January 1, 2014), I will draw three names from a list and give away and send three free copies of The Hidden White House to a trio of lucky history buffs. It’s easy to be eligible for this drawing. All you need to do is sign up for a free email subscription to my Presidential History Blog at www.PresidentialHistory.com. If you’re already an email subscriber to my blog, you’re also eligible for the drawing. 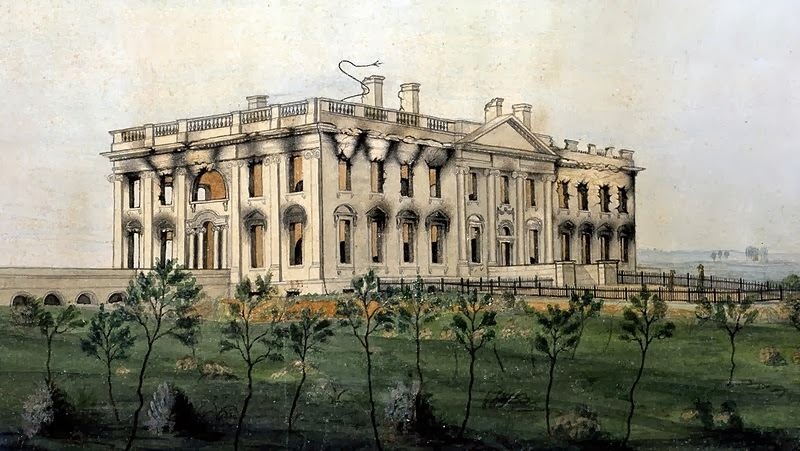 Burned in 1814: During the War of 1812, British forces swept into Washington, DC on August 24, 1814 and torched The President’s House shortly after President James Madison left town in haste. 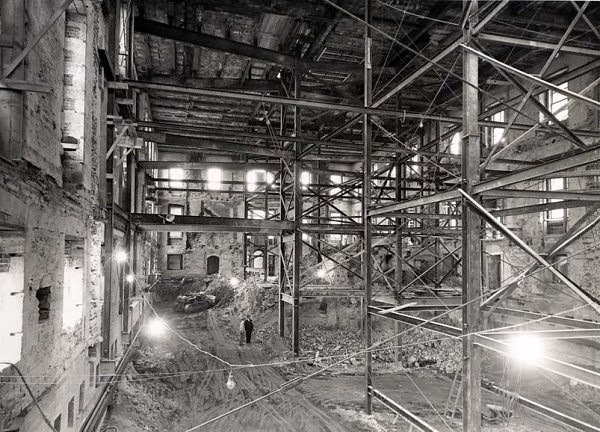 The house was re-built but many of the charred timbers that supported the interior of the building were kept in place in the repaired White House, leaving for a future president to address the less than sturdy structure. “It was during Bess and Margaret’s first extended absence that the president became acquainted with the White House ghosts. Introductions took place on a balmy night in June 1945, a little more than a month after the family had moved in. Alone in the big house, Truman sat down to write a letter to his wife. That night, the president was most likely working in the Oval Study upstairs, even though the room (unlike the bedrooms) had no air-conditioning. But Truman’s books were in the study, as was his piano and his desk. The desk was no ordinary piece of furniture. A lavishly carved oaken relic presented to President Hayes in 1879 by Queen Victoria, it had been handcrafted from the timbers of the HMS Resolute, a British expeditionary vessel abandoned in an ice field by its crew in 1854. Resolute had been adrift for a year by the time the American whaler George Henry had found her. The desk was, in other words, made from a ghost ship. Did Harry Truman believe in ghosts? He was about to. He sat in a huge swivel chair, its leather soft from use, its casters coasting softly on the carpet as Truman slipped his legs into the knee-hole. The desk’s broad surface was a muddle of books and papers, ephemera of every kind encroaching on the blotter like an invading army: paperweights, pens, and picture frames, a black telephone at his left elbow and a chrome picture of ice water off to his right. His pen scratched quietly on the paper below the banker’s lamp. Politics: Klara tells the story of sagging ceilings, stretching and tinkling chandeliers over social events in the White House, and inspections that revealed a sinking and collapsing mansion. White House officials chose the moment of a state dinner in 1947 to inform the President that the chandelier chain in the East Room was “stretching.” Truman sarcastically noted later that “It was a nice time to tell me.” Concerns grew about the safety of the President and his family and they were eventually moved out to the Blair House across the street. But Congress still needed to appropriate money for the expensive reconstruction, leaving some financially conservative members of Congress to consider tearing down the entire mansion and building something cheaper. Ultimately, the outside walls were saved, but the interior was totally re-built. Congress appointed a commission to oversee the work, but Truman himself played a decisive role in directing the work. Process: Klara takes the reader from the discovery of the failing structure through the decision making process about what to about it, to the actual gutting of the interior and saving of historical items (many of which would be cut up and sold as souvenirs), through the delayed and over budget construction process that included the building of an underground bomb-proof shelter. Along the way is the story of the attempted assassination of President Truman who was temporarily residing in the security-challenged Blair House across the street from the White House. People: Klara does a masterful job of painting portraits of the key people involved in the decision and actual implementation of the rebuilding of the White House, from members of Congress, to members of the commission in charge of the renovation, to White House staff to the contractors. These men, and the Truman family, come alive under Klara’s steady hand and insightful heart. About Robert Klara: Robert Klara is also the author of the critically acclaimed book FDR’s Funeral Train, another favorite of mine. Klara, who lives in New York City, has been a staff editor for several magazines and his freelance work has appeared in The New York Times, American Heritage, and The Christian Science Monitor, among other publications. Get your free copy of the book: Don’t forget about the drawing for three free copies of The Hidden White House that I will hold on January 1, 2014. To be eligible, all you need to do is sign up for a free email subscription to my Presidential History Blog at www.PresidentialHistory.com. If you’re already an email subscriber to my blog, you’re also eligible for the drawing.